Hi there Remodelaholic fans! Ursula here from Home Made by Carmona, where I’m always get’in my DIY on. Last time I was here I shared how to make a DIY Bookcase Hutch out of a couple old icky bookshelves and some scrap wood (yep I like to use my leftovers up good!). Today I’m sharing yet another awesome project you can make out of your leftover scraps (I can totally hear my mom in my head saying “waste not want not child”. Clearly I took that to heart). Use up those random bits of 2×4’s lying around your garage by turning it into a Restoration Hardware knock-off phone charging station!! Don’t you love that store? I know I do (even though my wallet begs to differ). Well this project only takes about 15 minutes (plus a couple drying hours), and a couple bucks at most, so your wallet and your good sense of taste will thank you profusely. Here is a picture of the original, gorgeous right? It comes in oak and in walnut for $79 . Today I noticed it came down to $29, which still makes my wallet sting. Nope, not when I can have a great knock-off with 15 minutes of effort! However, your DIY knock-off version will come in whatever stain or color you love most, and cost you about $2 and some scrap. I chose a mahogany for mine, and I absolutely love it! Let’s get started!! Be sure to use a scrap 2×4 that is at least a foot long. This is to make sure it is long enough to stay put when you use the router on it. Strat by tracing the base of your phone onto the 2×4. Next you’re going to whip out your router…if you have a guide, great! If you don’t (which sadly mine was broken), then you might want to practice on some other scrap wood first. You’ll start at one end of the template you marked, and very slowly and precisely make one long pass horizontally, then a second pass. It should only take two careful passes, and if you can, round out the ends ever so slightly. If your guide is intact, then your cuts should be perfect! If you are going freehanded like me, then you’ll have some minor imperfections, but trust me when I say it won’t be very noticeable once it is stained. Now you are going to mark the very middle where the charger plug will insert into. Mark it to the same width as your charger end. You’ll need a drill bit the same thickness as the charger end. Don’t worry, clearly it can’t be the width, just the thickness. 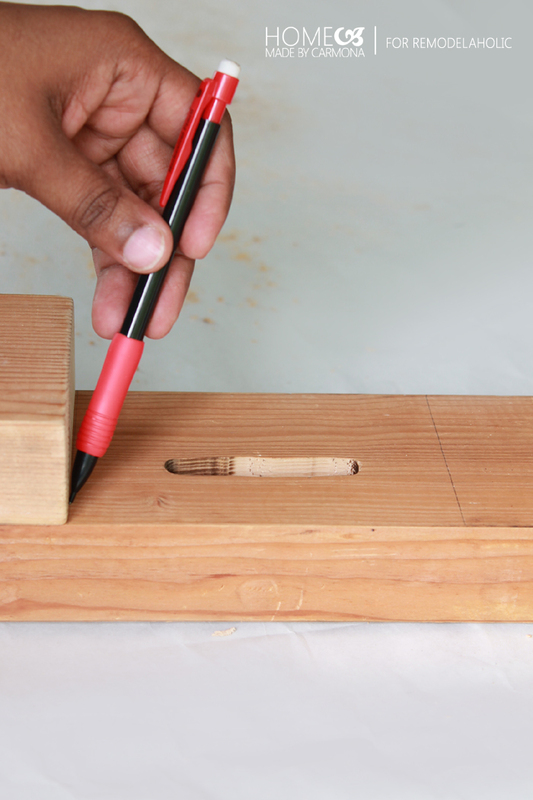 Create a stand by setting the 2×4 atop some wood so you can drill through and through. Be sure when you drill the hole you it is straight. I may or may not have gone in at an angle and had to work that hole! Haha! Do a second and third hole side by side, then go back and wiggle the bit back and forth while drilling to cause the 2-3 holes to “connect”. Now you’ll have a place to pull your charger through! Check to make sure the plug in fits nicely…not too snug, you want to be able to pull it through and plug in, but not too loose either. Ok, once tested, remove it, it is time to finish this project up! Mark where you want to cut for the length you desire your phone charging station to be. Cut that baby down to size. I’m using my miter saw, but if you have a table saw or jig saw that will work too! Now she’s ready for a good sanding, and your choice of stain! Finally seal it with a great wipe-on poly urethane, or a spray on-poly. Once it is completely dry add some furniture glides to the bottom. Place them on the inner middle portions so they do not show, and you’re done! Well, what did I tell you? A stunner in just 15 minutes of work, and a couple hours of drying time! And how much did you spend? Probably just a couple bucks for furniture glides since everything else is leftovers from other projects…much different from the high price of the original, right? I hope you loved this easy little project. My pretty little charging station is going to sit on my side table in my newly made over bedroom. I have to say, from the small projects to the more complex ones, this room just puts a smile on my face. From the Gorgeous gallery wall above my bed, to the DIY diamond tufted headboard, to the DIY letter holder, and now my new phone charger… *happy sigh* this bedroom is finally what I’ve always dreamed it would be! and of course… the desk itself! Build a mid-century style desk. Really nicely done. How do you make sure the charger cable doesn’t band and break.